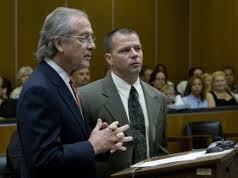 On Friday December 20, 2013 former Phoenix Police Officer Rich Chrisman was sentenced by Superior Court Judge Warren Granville to seven years in prison for aggravated assault along with another five years for reckless manslaughter. Both sentences are to run concurrently. This sentence stems from the October 5, 2010 domestic violence call that officers Rich Chrisman and Sergio Virgillo responded to at a mobile home park at 302 E. South Mountain Avenue which ultimately resulted in the death of domestic violence suspect Daniel Rodriguez. In this final court appearance, Judge Granville heard statements from both sides prior to handing down the sentence. Rich’s side of the court room was filled to capacity with family, friends and fellow officers who were there to lend moral support. Officers Matt Morgan and AJ Buffa along with friends and family members presented statements in support of Rich. PLEA Vice President Ken Crane presented a statement from the Phoenix Law Enforcement Association on Rich’s behalf expressing the Association’s support for Rich. Deputy County Attorney Juan Martinez, as expected, attempted to portray Rich in a negative and false light up to the very end. Martinez paraded Rich’s ex-wife into the court room to sling more mud against the wall at the 11th hour in what could only be taken as an absurd last ditch attempt to negatively influence the court against Rich. Judge Granville seemed to see this pathetic tactic for what it was as it did not appear to have any impact on his final decision. CLICK HERE to read a copy of the statement presented by PLEA to the court.